President Trump has said he’ll know within one minute whether North Korean leader Kim Jong-un is serious about denuclearization. That first minute is rapidly approaching. What to watch: The hours leading up to the starting gun have been an exercise in expectations setting. Secretary of State Mike Pompeo was careful to note that while the summit is historic, its aim is to “set the conditions for future productive talks.” But even he can’t predict what will happen when the two leaders sit down, one-on-one, in just a couple of hours. Note: Singapore is 12 hours ahead of the U.S. East Coast. 9am local [9pm ET]: Trump greets Kim, with a 45 minute one-on-one meeting (which will include translators) beginning at 9:15. 10am: Pompeo, Chief of Staff John Kelly, and National Security Advisor John Bolton join for an expanded bilateral meeting. 11:30am: Press Secretary Sarah Sanders, Ambassador Sung Kim, and NSC Asia chief Matt Pottinger join the group for a working lunch. 4pm: Trump holds a press conference. 7pm: Trump departs for Washington, by way of Guam and Hawaii. Axios' Jonathan Swan and Alayna Treene report that Trump is expected to tape an interview with Fox News' Sean Hannity after the summit and before leaving Singapore. Sung Kim, a veteran diplomat and the current ambassador to the Philippines, has led discussions with the North Korean side in Singapore. Pompeo said those talks were moving quickly and successfully, despite reports to the contrary. While Trump has spent most of his time in Singapore in his hotel, Kim was spotted out on the town with a massive security detail, taking in glamorous sights, posing for a selfie and, bizarrely, being cheered by onlookers. Trump called South Korean President Moon and Japanese Prime Minister Abe. As the Washington Post notes, the decision to begin the summit "without top advisers or nuclear arms specialists in the room underscores that their real goal is to develop a rapport and stage a global spectacle rather than to ink the technical details of a denuclearization accord." Victor Cha of CSIS writes that the summit is only the start of a negotiation process — and that’s good news. 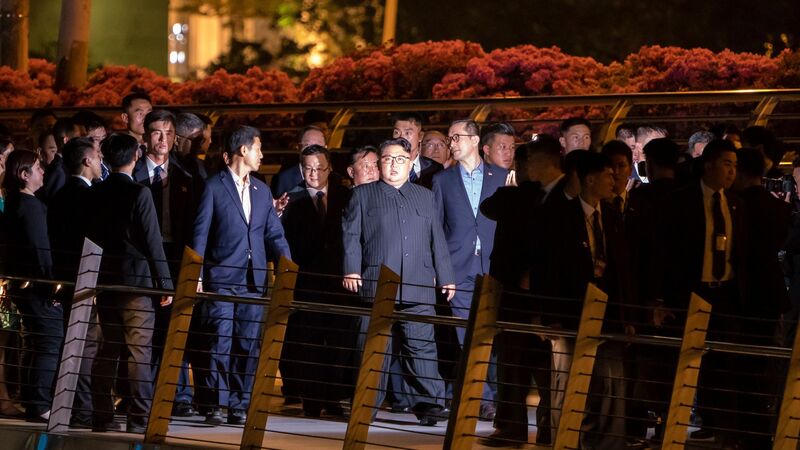 Data shows North Korea is less likely to take provocative actions while they’re negotiating with the U.S.
Jieun Baek, author of "North Korea's Hidden Revolution," writes in Foreign Affairs that "while in Singapore, Trump must be mindful of how Pyongyang will use the negotiations for propaganda in order to further bolster the regime’s legitimacy." That means, in her opinion, avoiding both public threats and flattery. Go deeper: Scoop... Trump open to U.S. embassy in North Korea, What that could mean for the U.S.
Why to worry: Michael O'Hanlon of Brookings says bad outcomes include: 1. The U.S. gambles away its military alliance with South Korea for insufficient returns. 2. Negotiations fall apart, but global appetites for maximum pressure on Pyongyang are gone. 3. The leaders clash and "we wind up on the path towards 2017 again, and seem on the brink of war." Why to hope WaPo's Anna Fifield writes: "Despite everything I’ve learned in the 14 years since I began covering North Korea, despite myself, I feel hopeful again now ahead of Tuesday’s summit. ... I’m not optimistic about complete denuclearization. No way. ... But this moment feels different. This process is different. These leaders are different. " Word of advice: Ryan Hass of Brookings says to watch for "recycled language" from previous agreements in North Korea's post-summit statements. "That would be a key indicator" that there was no breakthrough, he says. Go deeper: Kim Jong-un's intelligence file, What Kim wants from Trump.